Nilla's Spin: Lanes for okada? Normally, when I get on an okada (commercial motorcycle/bike), I tell the okada man to be careful and not throw me off the bike. Sometimes they laugh and tell me they won’t throw me off, or just nod their heads. But yet, I have to continually keep tapping them and telling them to keep their stunts on the down low…”Oga, no throw me for ground oh?” Some of them actually slow down, while some of them continue moving recklessly and no amount of shouting will make any difference, like the one I was on yesterday, that had me ducking poles hanging out of a truck (like he couldn’t calculate that the poles hanging out weren’t higher than our heads…yeah right!!). Oh, and they move in both direction even on one way roads/lanes! 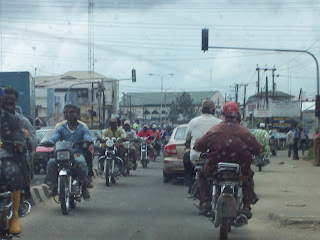 I think okada’s should have their own lanes on roads, especially those areas with heavy traffic. It would reduce accidents and near-accidents on our roads. Should lanes for okada be considered when designing and constructing new roads and also when expanding some of the existing roads? I remember one stupid one I almost gave a beating once. We were in the thick of one crazy traffic jam and he decided to ride through water. He didn't tell me anything and my mind was completely elsewhere. Suddenly, I saw something in front of me. The idiot had ridden under a signboard without warning me! I'm lucky I had good reflexes. I dodged backwards, almost upsetting us both in the process. If you make a lane for okada, how do you demarcate it? What's the likelihood that they won't still jump in front of trailers when their lanes are crowded? I agree with azuka...if you make a lane for an okada how do you get the daredevils to stick to their lanes plus how do you stop other vehicles or foot traffic from getting in the okada-designated lanes. I remember once I was on an okada and he hit someone. I had to hang on for dear life so I would not be thrown into a gutter. When we all gathered ourselves, the okada driver said the guy was a winch and just appeared in front of him. You can imagine the annoying back and forth that ensued as I gave the okada my ten naira and walked the rest of the way to my destination. The okada-designated lanes is an excellent idea - it is good on paper, but when the rubber hits the road, is it really viable in our society especially when (at least the last time I was home) it seems like all okada drivers have death wish and could not care less! ..If you make a lane for okada, how do you demarcate it? What's the likelihood that they won't still jump in front of trailers when their lanes are crowded?.. It could be demarcated by stripes or by curbs, and their lanes could be on the right of regular lanes. If it's demarcated by curbs, then we won't have to worry about them jumping to vehicular lanes, unless they want to fly (assuming the curbs are high enough)...lol. "..When we all gathered ourselves, the okada driver said the guy was a winch and just appeared in front of him..."
LOL, I'm sure the guy thought the okada was a winch as well and just appeared. even though okadas are very efficient when it comes to getting you where you wanna go asap, i still think those things are hella dangerous..giving them their own lanes? thats just asking for a hell mouth on the roads....and its not like Nigerian roads ain't dangerous enuff. Okada, the way we know it today should be banned! It is definitely an unusual way to travel around the town. They appeared on the scene sometime in the mid 90's and unfortunately we have allowed it to become a way of life. The govenment should take care of the transport system and give people a decent means of travel. If you study the faces of the Okada riders you will know that even if they have a separate lane of their own they will still be as reckless as ever. While we are at it however, both the driver and the passenger should be made to wear helmets as a life saving device. I definitly think lanes should be introduced for Okads or remove them all together! They are soo Dangerous! Vote Abuja Babe! for your Blogville Idol!! I think its just the way Nigeria is and Nigerians are - totally lawless, with no sense to plan and execute such plans, without an extra effort to 'encourage them by force'. Just go to Accra and see signs and wonders: Okadas lining up at their okada-stops, no need for tax-collectors, riding in their own lanes to and fro, no james-bond moves resulting in accidents etc: as in things just going in order, even without outrightly demarcating roads? Even public transportation is well organized. Bus riders line up at bus-stops without touts. Bus conductors have a sit in their own buses and are well-dressed, for God's sake. Why do you think the Lagos state government has to spend millions to break up and demarcate routes because of BRT. Is this how the road is demarcated all around the world? Is it just to make the buses seriously 'rapid' or because Lagosians(Nigerians) will never follow instruction? - even the most simple and harmless ones? I'm afraid to say that demarcating lanes for an okada is only slightly less pointless than putting a sign saying 'I beg you, please do not steal this' next to a large number of laundry bags filled with naira notes that have been dumped in public in Lagos. Why should an okada rider confine himself to a demarcated lane when he can weave all over the road, in between buses, through potholes, underneath trailers, over checkpoint barriers and right through hapless pedestrians? Lanes for Okada?...that must be some wishful thinking! I echo 36 inches comments. Okadas are nothing more than their slogan, "Carry me and kill me!" and they should be scraped! Dear friends, please do not forget to send in your submissions, a lot of people have sent in great stuff but a lot of my favourite bloggers are missing, what's up, people? Come on, send in your stuff! June 15th is the last day, come on! Submissions should be sent to nigerianbloggers@yahoo.com not later than Friday, June the 15th 2007 stating date of blogging and blogname/address. Nilla all I have to say is you are very brave. You could not pay me enough money to get on an okada. As for the lane issue, I definitely think it will cut down a lot of the casualties if they have their own lane. I agree with you on both the drivers and passengers wearing helmets (at least the drivers in calabar do that). lol, I'm yet to see that happen. @ Those that want okada scrapped. So what will the okada drivers be doing when they no longer have their jobs. And i think scrapping them will make the traffic situation worse. Yes, lanes for okada is good. Keep daydreaming o. LOL. You berra come back here. Me I am missing you o. Still up for service this Sept? You know who this is. LOL. i forgot i was up to do something last week, i'll definitely put something up on fri if you don't have a host already. anyhow let me know. What do I say?........Welcome to the world. 'Cos "this is how we do it". They're like fragile but talkative and abusive chickens... you know you can kill 'em-- but they dart in front of you and curse like they fly. I really wish the roads here could be widened and okadas get their own lanes -- that's if they'd stick to their own sides... They drive on everything they can and giving them their own lanes wont tie them down-- I doubt it but it's a good idea. this is a very good idea and very plausable. in rio they have seperate lanes for bycicles. Absolutely. They should absolutely have their own lanes. Malaysia is a developing country. They didn't outright ban bikes (like in Abuja) but incoorporated it into their road system by giving them seperate lanes, making it mandatory for them to wear helmet and even during the day thier head light must always be on - all for their own safety. Only a truly caring govenment can solve the sorge of okada riders. Not by banning them and destroying their livelihood. I think that they should be banned! They are way too dangerous. You'll find boys no older than 13 driving those darn things. At times they are drunk or high and their eyes are bloodshot. Of course 99.9% of them dont have a licence.